Here’s something funny that was produced for the Open University this summer. Everyone else has been posting it this week, I decided to join the herd. Why isn’t life on earth more diverse than it in fact is? Via Kottke, a New Scientist piece on the hypothesis that the earliest common ancestor of all life on earth was a mega-organism of planetary scale. That’s one way of solving a problem that I sometimes wonder about. If, as we now hear from exobiology types, life can be expected to originate wherever in the universe conditions will sustain it, how many times did it arise on this planet? If the answer is “many times” and life has arisen independently many times in the history of the earth, why do all of the organisms we see look so similar that they might have a common ancestor? Of course several solutions have been proposed to this problem, but the idea of a mega-organism that assimilated some previous life-forms and drove the rest to extinction would seem to be another. I’ve been putting in some long hours on the job recently, which is why I haven’t been posting much. One thing I do to break up the monotony of long sessions of paperwork is to let one or another of our Pandora stations play in the background. Pandora has introduced me to a lot of music that I like very much. For example, I’d never heard of Labi Siffre until “Bless the Telephone” popped up on some station or other, now he’s one of my favorites. Nor had I heard of Polk Miller until “Pussycat Rag” ” (download it for free here) came on our station devoted to the Hoosier Hotshots, now I can’t get enough of him either. So here are YouTube embeds featuring those two artists. Also, here’s Labi Siffre’s own website. Since Polk Miller died in 1913, he doesn’t maintain a website, but here’s a review of a CD release of his recordings. The US Congress is considering the “Stop Online Piracy Act,” a bill which, if passed, would greatly increase the power of corporations to censor websites, either by insisting on government action or by directly intervening. Here are a few links to reports about how bad the bill is and what can be done to stop it. This gallery consists of computer-generated 41 composite photographs. 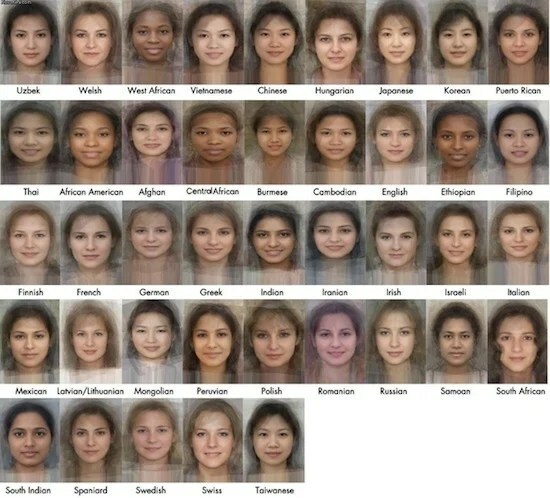 Each composite was made by overlaying digital images of several women of the indicated ethnicity and averaging their facial characteristics. Back in February, this gallery provoked a great deal of public discussion. Some people behaved as though it revealed a deep truth about the racial divisions of humankind, while others not only rejected this idea but regarded the whole thing as a joke in questionable taste. What I’ve been waiting for is for someone use the same technology to to do something useful, or at least something more interesting than this. For example, a composite photo of the 43 men who have served as US president might be interesting, especially if presented as a series of 43 slides. Slide 1 would show George Washington, slide 2 would show George Washington + John Adams, slide 3 would show George Washington + John Adams + Thomas Jefferson, etc. The change in appearance of the composite would of course be less each time, as each successive president contributed a smaller share to the adjusted average, but it might be interesting to see the final image gradually crystallize. It would be especially intriguing to compare the development of that composite with a similarly presented composite of a line of hereditary monarchs.